Latha Mathavan Arts & Science College, Madurai has advertised in the DINAMALAR newspaper for recruitment of Lecturers Plus Non-Faculty jobs vacancies. Interested and eligible job aspirants are requested to apply within a week from 17th March 2019. Check out further more details below. Name of the College : Latha Mathavan Arts & Science College, Madurai. About College: The Latha Mathavan Arts & Science College concerns with social and cultural developments: it focuses the requirements of Humanity through Teaching,Research and Extension in Social Relevant issues: The Students and the Faculty of Latha Mathavan Arts and Science are cultivated to serve Humanity and eventually become the Leaders of society Latha Mathavan Groups of Institutions add one more feather its crown by starting an Arts and Science College. PG with M.Phil in relevant department. SET / NET / Ph.D will be preferred. 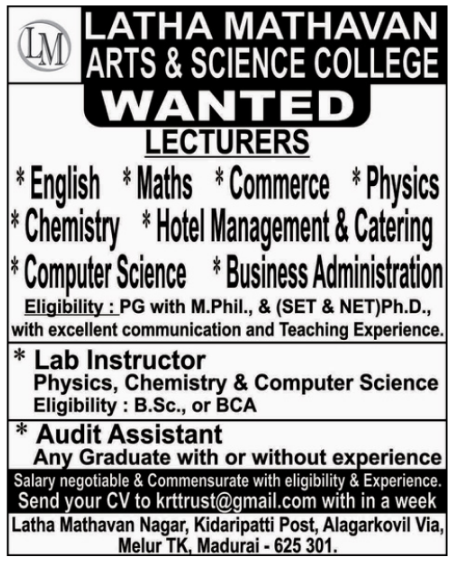 How to apply: Interested & eligible candidates may send your CV within 7 days to the Email: krttrust@gmail.com. Shortlisted candidates will be called for interview.